If you're looking for my Solar Power Calculator, click here to jump to it. 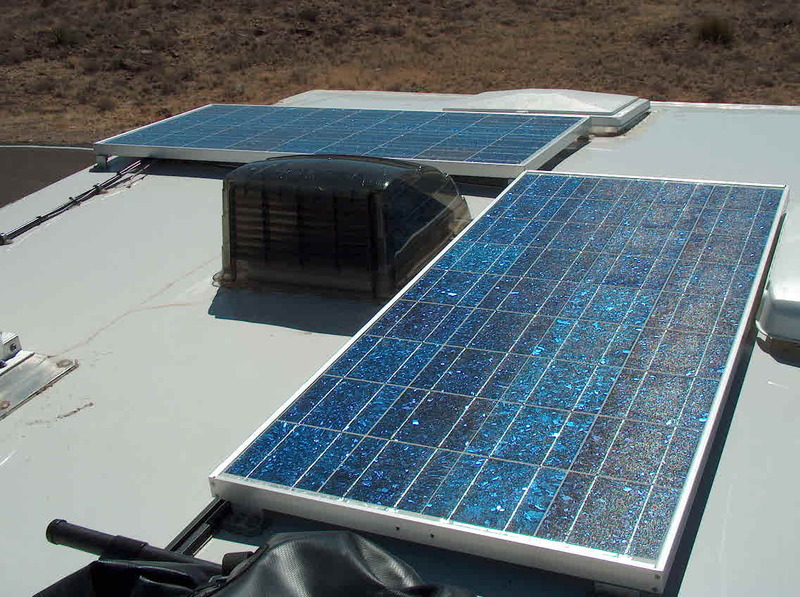 We realized quite early on – before we even had an RV, actually – that we wanted solar panels. The lure of clean, silent electricity from the sun, including the implication of freedom from electric hookups, was undeniable. This desire transformed itself into a genuine need after we hit the road. Time and again we found ourselves far from "the grid" but with me needing to be online for work, necessitating lots of noisy, smelly usage of our camper's LP generator. Solar panels were indeed the obvious answer. 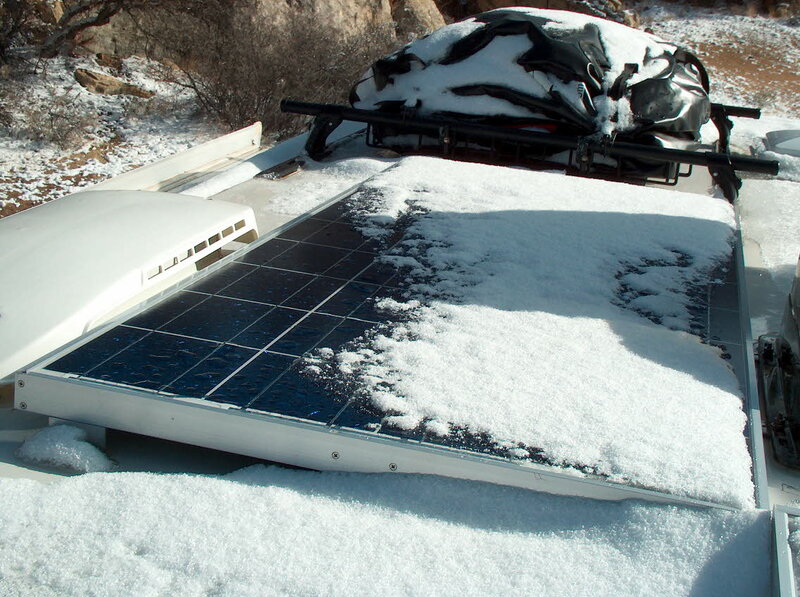 Our Lance had been available with an option for a 50-watt panel, but we hadn't ordered it – not because we didn't think we wanted solar, but because we knew we could fit way more than 50W worth up there. We did, however, get the "pre-wired for solar" option, which basically meant that Lance had run a pair of 12-gauge wires from the roof to the general vicinity of the battery. So we were ready for solar, we just had to do it. I got up on the roof with my tape measure, picked out an area in the front corners that wouldn't interfere with our other plans for the roof, and determined how much space we had to work with. I then started hunting around for prices on the Internet. Big solar panels (officially called photovoltaic (PV) modules) are one of these things that are only made by a few manufacturers, but are sold by many dozens of retailers for vastly different prices. And a lot of people don't realize this, so the big-name retailers like Camping World charge premium prices. But the Escapees Forum turned me on to an online solar price survey, which led me to the dealers with good prices. Looking through their websites, I soon decided that a pair of 56" x 26" (1425mm x 652mm), 120-watt Kyocera modules would fit nicely into the spaces I'd picked out. And I selected ETA Engineering as the place to buy them from; they had a good, usable website and their prices were about as good as anyone's. 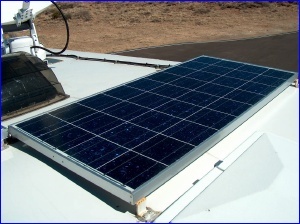 More than panels are required for a solar power system, however. You also need mounts to attach them to the roof: For RVs, these come in 2 basic varieties, fixed and tilting. The tilting sort allow you to prop your panels up so that they're facing the sun more directly, and thus catching more rays. Sounds good, but there are two major drawbacks: First, if you don't park your RV pointing the right direction, your panels aren't going to tilt the right direction. Second, you need to go up on the roof to do the actual tilting every time you park, and then go back up to lay them down when you're ready to move again (unless you can rig up a way do to it from inside). We had enough limitations on parking options imposed by our satellite dish that I wasn't keen to add another, and we move often enough that the thought of climbing up on the roof every few days didn't appeal. So I decided on fixed mounts, which hold the panels parallel to the roof. 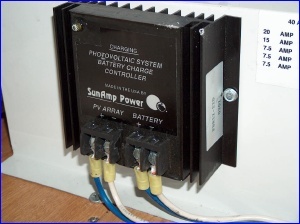 You also need a solar charge controller (sometimes called a charge regulator) to keep the panels from overcharging your battery. If you have a small enough panel, it puts out little enough current that you can get away without one, but with 240W up there our charge would definitely need regulation. We bought a fairly basic controller, a SunAmp 22A, not too expensive but with enough capacity that we can add a third panel (which we should have space for) if we want to. In retrospect, I wish I'd split for the more expensive MPPT controller that turns your modules' excess voltage into charging current (more about the voltage later). It wouldn't be hard to upgrade, though. All of these ancillary bits I ordered from RV Solar Electric, one of the standard sources you always hear mentioned when this subject comes up. Although their panel prices weren't competitive, the other prices were, and they know their stuff. We had all the parts, including the modules, shipped to a hotel we were going to in Denver (for a business meeting), and made an appointment at a local RV shop to get it all installed. Our roof space is severely limited, and we had specifically picked out these panels to fit on the front corners of the roof. We asked the shop to install them there, to which their response was, "We'll see where there's room for them." Without further consulting us, they put the panels someplace else entirely, directly in front and to one side of the one roof vent where we had any hope of putting an air conditioner. In order to install an AC now, we'll have to move the panels. Their choice of mounting location was also fairly close to our big satellite dish, so if we park the camper pointed north or west, the dish shades the panels. 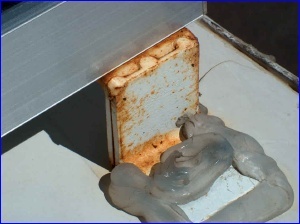 They neglected to install any fuses anywhere in the system, contrary to every accepted electrical practice. They wired the charge controller output straight to the battery, bypassing both the battery disconnect switch and my ammeter, thus preventing me from being able to monitor the rate of charge from the solar array. In the process of going to the battery, they peeled back the sealant between the battery box and the inside of the camper and left it open, potentially allowing explosive hydrogen into our living space should the battery offgas. Fortunately, this is unlikely with our AGM battery, but it's still a bad idea. RV Solar Electric hadn't sent us enough panel mounts, so this shop offered to make us the ones we needed. They're now rusting away on our roof. Generally, the quality of the work was sloppy and shoddy, with incorrect connectors forced to fit on the charge controller and lots of insulation & wire bits left strewn about the interior of the camper. Which brings me to a separate point – what's an RV owner to do when they need work done? Horror stories much worse than these are rampant in the online RV communities, and even in our own (very limited) experience, 4 out of 5 RV shops can't be trusted to do quality work. Never mind, back to the solar panels. After redoing most of their work, we now have a functioning solar system, the heart of which is those two big 120-watt modules. I want to say a bit about solar panel ratings before I get to our experience with them. And be warned, this is about to get mildly technical. Some members of the class (you know who you are) may want to brush up on their electricity basics. Right, here we go! It seems that individual modules are typically meant for a 12-volt system like ours, and are rated with a wattage number (like 120). Now, this doesn't actually mean that they produce 10 amps, because their working voltage is substantially higher than 12 – ours are rated at 16.9V. Why? Because there is always some voltage drop in the wiring of the system, most charge controllers lose a bit to internal inefficiencies, and the nature of 12V batteries is such that they need comfortably more than 12V to charge well – typically 13.5-14V. So the panels are designed with enough voltage to spare for all of this, but this means that you don't get quite the output current you might be expecting. In our case, rated current is 7.1A, which does indeed work out to 120W (16.9V x 7.1A). 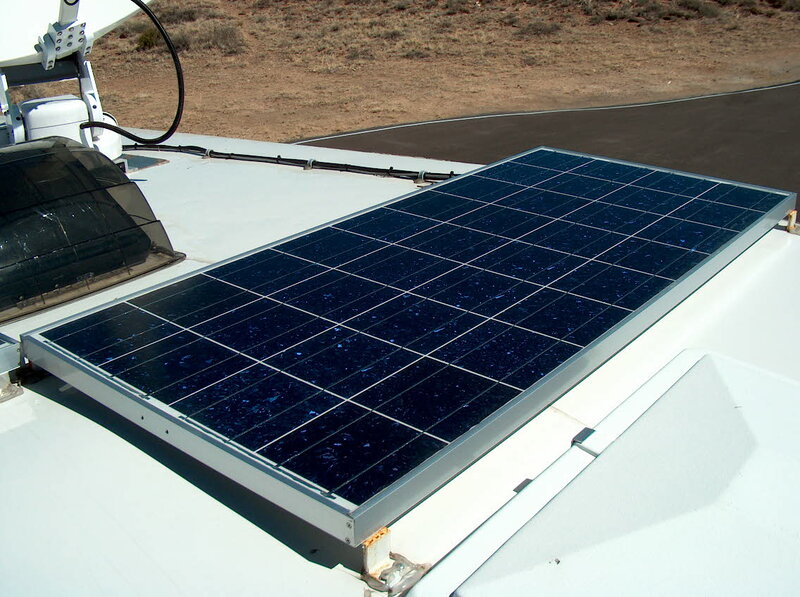 The rated power of 120W is also at what is considered to be "standard conditions": a clear sky, sun directly overhead, panel temperature 77° F (25° C), and so forth. Not surprisingly, these conditions rarely converge in the Real World, meaning that the power you actually see from your panels will usually be less – or occasionally more – than their rating. And our experience bears this out. The rated current of our two modules is 14.2A, but the highest I've actually seen is in the neighborhood of 11A. I believe this is mostly because they were installed in October, I'm writing this in March, and we're in the northern hemisphere – meaning the winter sun is far from being directly overhead. Allllllllrighty then, now we're getting to the real issue: power. How well do our solar panels do the job they were purchased for – supplying me with enough electrons to earn our living? To be honest, they're not quite up to it so far. The laptop computer and satellite modems draw about 6 amps every minute they're on, which in a full workday amounts to about 50 amp-hours. Add another 20Ah or so a day for lights & such in the camper, maybe another 20 for the furnace at this time of year, and about 10 for the camper's phantom loads (fridge electronics, LPG and CO detectors, etc). That pretty well accounts for our 105Ah battery in only one day. And being winter, we're just not getting that much charge from the panels – maybe 60Ah on a clear day. Maybe. Throw in a bit of recreational computer use in the evening (like watching a DVD, surfing the 'net, or me writing this article), and we're way over. So we still run the generator for an hour or two on such days. But you can see that half our load is my work, meaning that on days when I'm not working, our panels can generally keep up. Today was one such non-work day; our battery was at 54% this morning, and by tonight, it was up to 97% – just from solar. And come the summer, I think we'll be doing fine� except then we'll either go north (where the sun's lower in the sky) or need to run an air conditioner (which uses so much power that RV rooftop solar is out of the question). We'll have to see. I do want to say a bit about batteries here. 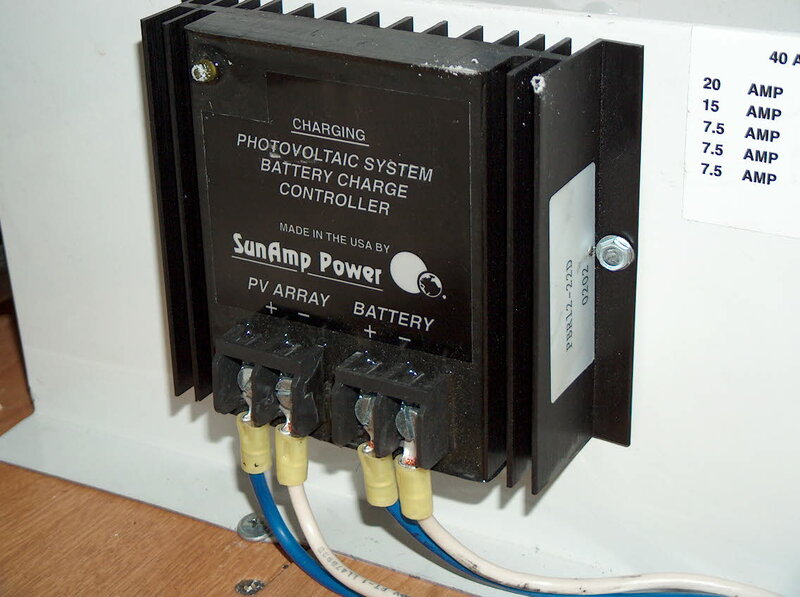 You might wonder why I'm talking about the camper battery so much in a Solar Power article. I would have wondered myself, once, because the popular image is of solar energy just running your electrical devices. But the fact is, you have varying energy requirements over the course of a 24-hour day, and your solar panels are producing energy on their own schedule during the daylight hours. The battery is a crucial part of this system, because it stores the energy from the panels until you actually need it. When you need more than the panels are producing at a given moment, you draw from the battery; when the panels are producing a surplus, they charge the battery. And at times, sure, you're using power straight from the panels. But it's easier to conceptually separate the two systems, and think about your electrical loads drawing out on one side and the panel charging on the other – even though it's a single system with a battery bank in the middle. Our design rule is that a solar panel will contribute as much as half of its wattage, in amp-hours, each day if aimed at the sun and perhaps 25% if randomly oriented. Meaning that our randomly-oriented 240-watt array should contribute about 60Ah. Well, fair enough as far as it goes – that is actually about what we're seeing these days. But shouldn't it be more when we're further south? Can't we expect more come summer? Won't the thinner atmosphere in the mountains allow more photons onto the panels (and thus electrons into the wires) than when we're at sea level? The Design Tools from Sustainable Design Studios, for acquainting me with the basic terminology and equations of solar position calculations. Visual Calculus from the University of Tennessee – Knoxville, for refreshing my embarrassingly rusty memory of integration. The Photovoltaic Program Publications from Sandia National Laboratories, and the Solar Radiation Resource Information at the National Center for Photovoltaics (National Renewable Energy Lab), two outstanding sources of general information on PV performance parameters. The NREL site also has a nice interactive US map that will give you numbers similar to this calculator, but the catch is that if you're not a solar enthusiast, its results are a bit hard to interpret. So here's a tip: Use the map to find a kWh/m2/day value, multiply that by the rated current of your array in amps, and you'll have your expected daily array output in amp-hours! If I had found this map first, I probably wouldn't have built my calculator, but that's OK – I don't regret it, they serve slightly different purposes. First, shortly after I wrote the above article, the panels got to a point of producing enough for all our electrical needs, under good conditions (sunny days, no trees, etc.). Generator usage became needed only when we wanted to run an AC appliance too big for our little inverter (we really need a bigger one) – in fact, we had a couple of months where we often ran it only for the weekly "exercise" that its manufacturer recommends. Under suboptimal conditions (shade on the panels) we still usually did all right; I would just try to do a bit less work on those days, when I could, or we'd dip into our battery reserve. Second, as the summer really got going, I started to notice serious degredation of the panel output due to heating. The highest current I've seen is about 14A in early April in New Mexico, when the sun was only medium-high but temperatures were still fairly mild, rarely above 70° F (22° C). This is actually above the modules' rated output for that date and latitude. By early summer, I should have been getting 14A from them, but central California was just too hot – frequently 100° F (38° C) – and we rarely got more than about 11 or 12A. However, the longer days generally made up the difference, and we had enough power to live on.
] Nonetheless, I would definitely say that our solar system was worth the investment, and would wholeheartedly recommend such a setup to virtually any RVer. It has done what we wanted it to, allowing us to go months without plugging our camper in – which in turn gives us much greater freedom of where we can go, essentially where we can live. In my opinon, this is what fulltiming is all about. Just a quick addendum: in early 2004 we filled most of our remaining roof space with two small panels, a 50W and an 80W. This brings our total to 370W, the figure you now see prefilled in the Calculator above. Read all about in my electrical upgrade article.